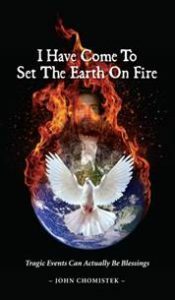 Come explore the best book that you will read all this year, “I Have Come To Set The Earth On Fire”. This book is more than just a story of a family surviving a horrific home fire, but details all the glory and grace given by God by doing His will as my family played its part in God’s little symphony, written to energize the generosity and mercy of our surrounding communities. It is my personal witness story, the story of my reason for hope, my journey that I hope someday leads to my glorious salvation in Jesus Christ in Heaven. It documents that bad things will happen to good people, but great and glorious things will rise from the ashes, put in place by God – even if I do not see the fruits of those crosses carried in my lifetime. The book, then, explores what really happened. What did I learn from my ordeals? How these events now challenge me to climb the steep road toward my Salvation? The book then challenges the readers to look within their own Faith journeys. What can be done to your Faith journey to aid your steep climb, past those lose rocks to stumble over? How do you find Jesus in your life? And, oh yes, put a smoke detector in your garage. Come now and read this great book that documents the best thing that ever happened to me but would not wish on my worst enemy – if I had one. Am I Satisfied With Just You, Oh Lord? Mother, do I really have to do it? Do You Want To Be The One Taken Or Left? What Is The Greatest Story You Ever Read? Sannywotly on Outraged? You better be! Troy Micciche on How often is God not #1 in my life? admin on How often is God not #1 in my life? MyWorldSecur on How often is God not #1 in my life? admin on Outraged? You better be! Copyright © 2019 House On Fire Publications. Powered by WordPress and Stargazer.